A child's finger can become caught in the rectangular metal clip or the black plastic side hinge, and this can sever a child's finger tip. Also, the strollers pose an entrapment hazard. The recall includes about 21,000 Mini Zooper Doll Strollers, which have a silver metal frame with a bright pink cotton canvas seat cover. "Pottery Barn Kids" is printed on a label on the canvas seat cover. Pottery Barn Kids retail stores nationwide, catalog, and Web site from October 2005 through June 2007 for about $50. 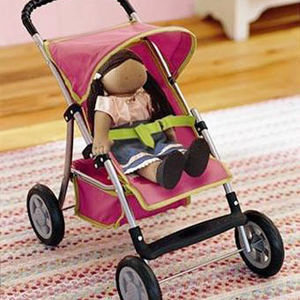 Immediately take the recalled doll strollers away from children and contact Pottery Barn Kids for instructions on receiving a repair kit. For additional information, call Pottery Barn Kids at (888) 367-0144 between 7 a.m. and 12 a.m. ET daily or visit their Web site at www.potterybarnkids.com.